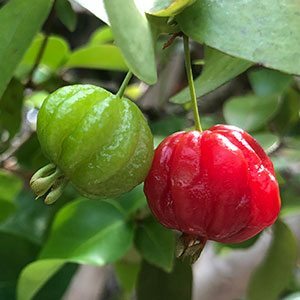 With fruits that look like tomatoes more that cherries, the Brazilian Cherry is ‘Eugenia uniflora’. This a small shrubby tree from South America that is grown for the fruits. The trees will bear fruit after about 3 years, and this shrubby tree that is related to the Lilly Pilly is fairly easy to grow. Once established the Brazilian Cherry tolerates frosts, water logged soil, and even dry conditions. It fruits in summer, the fruit following small white flowers in spring. The fruit itself is initially green, and as it ripens turns to a true strawberry (or tomato) red. Fruit need to ripen completely on the tree or it tends to be very tart. It does have a tendency to self seed and if you do decide to grow it, it needs to be planted away from forested and rural areas. Fruit forms quickly after flowering and is ripe when red, some varieties ripen to a deep red to purple colour. Height – Will reach 3 – 5m in height. Width – Will spread to 4m. Habit – Small spreading Tree or bushy shrub. Used for the fruit, also as a hedging plant. if pruned you will find that fruit production is much less than if left unpruned. Seeds can cause stomach pains and nausea. The plant is now considered an environmental weed and is no longer offered for sale, by most nurseries. If you do decide to grow this tree, or have one growing, you need to net the tree to prevent birds eating the fruit and spreading the seeds. The seeds germinate far to easily for this tree to be growing most gardens without becoming a problem.